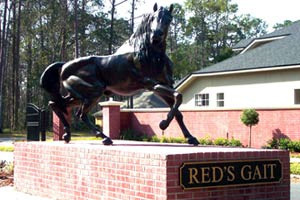 Red's Gait community in Jacksonville, Florida. Red's Gait is a new residential community by Providence Homes located in popular Mandarin area of Jacksonville, Florida. Red's Gait offers convenience to a variety of restaurants and shopping areas, as well as Interstate 295 and the St. Johns River. Red's Gait offers spacious 90' lot homes from 2,471-3,436 sq.ft. Choose from the Palmetto, Redington, Manasota, Bradenton, Englewood, and Bayport floorplans. The Manasota plan offers a 23' master suite and spacious kitchen/breakfast area. Its design is impeccable and you won't be longing for space with 4 bedrooms and 3 bathrooms. This luxury home offers the largest amount of square foot of all the plans. With 5 bedrooms, 2.5 baths and a loft, you'll always have somewhere to relax in this home.